The “Amazing Adventures Of Spiderman” ride at Universal’s Islands of Adventure, in Orlando, Florida, is currently closed. But it’s scheduled to reopen in March after undergoing a major refurbishment, and some of what we can expect to see with the new Spiderman ride is beginning to make its way out of the spider’s den. According to Universal, during the refurbishment the ride’s visuals are being completely remastered into 4K high def animation. The 3D projection systems are being upgraded to Infitec digital projectors, and there’s a new musical score. Universal is also making updates to the machinery of the ride itself. 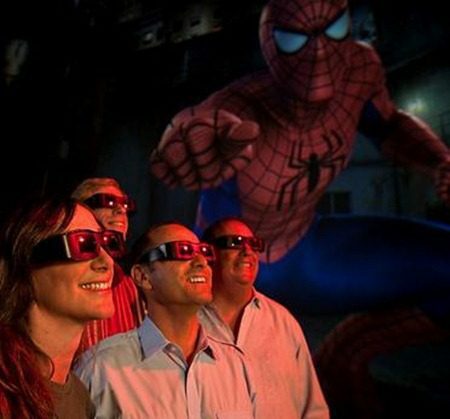 The refurbished ride will feature new 3D ‘Spider-Vision’ glasses. The glasses, seen in the photo below, have dichroic filters and are said to provide “amazing color and clarity.” Universal said the glasses will allow guests to see many more details than they could in the previous ride. This is the first major refurbishment since the “Amazing Adventures Of Spiderman” originally opened in 1999. The ride is expected to reopen in March, but Universal has not provided an exact opening date.